Fitzpatrick topped 400 yards passing for the fourth time this season, yet he may be headed back to the bench after the team's sixth loss in seven games following a 2-0 start. TAMPA, Fla. (AP) — Ryan Fitzpatrick has been down this road far more times than the veteran quarterback cares to remember. The Tampa Bay Buccaneers lost for the third straight time Sunday, failing to score a touchdown in a 16-3 loss to the Washington Redskins despite gaining 501 yards total offense and only punting once. Fitzpatrick topped 400 yards passing for the fourth time this season, yet he may be headed back to the bench after the team’s sixth loss in seven games following a 2-0 start. That means Jameis Winston, benched after throwing four interceptions in a loss at Cincinnati three weeks ago, may be on the verge of getting another chance. “We’ll talk about all personnel issues (Monday),” said coach Dirk Koetter, who also may consider changing kickers after Chandler Catanzaro missed two more field goals Sunday, one of them a 30-yarder. One change Koetter’s already made is resuming his role as offensive play caller. 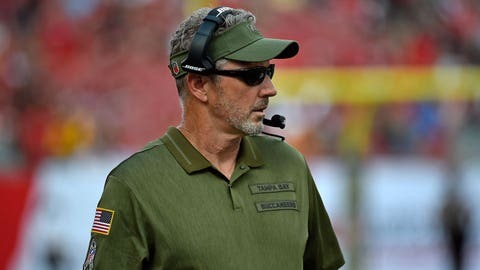 Offensive coordinator Todd Monken handled the responsibility for the first eight games, and the Bucs have the NFL’s No. 1 passing attack and rank second in total offense. So, why switch up before Sunday’s game? “Just my own reasons,” Koetter said. The Bucs (3-6) have missed the playoffs 10 consecutive seasons, the second-longest drought in the NFL behind the Cleveland Browns, who haven’t earned a berth since 2002. Fitzpatrick expects the team to stick together and eventually pull out of the tailspin. “Unfortunately for me, I’ve been in this situation 13 straight years in terms of a team that isn’t quite playing up to their potential and having some struggles,” said Fitzpatrick, who’s been with seven teams during a 14-year career. Moving the ball wasn’t a problem Sunday. The Bucs outgained the Redskins 501 yards to 286 and got inside the Washington 20 five times. An interception and two fumbles foiled scoring opportunities. A fourth turnover led to the last three field goals Dustin Hopkins kicked for the Redskins. Fitzpatrick, 2-4 as a starter this season, shrugged off a question about whether he played well enough to retain the starting job.